Meet the Natives is a reality television show that first aired in September 2007 on Channel 4 in the United Kingdom. This series included five tribesmen: Yapa, Joel, JJ, Posen and Albi, from the island of Tanna (Vanuatu) who travel to England to participate in an experiment which Guy Adams of The Independent called reverse anthropology. The series has three episodes in which they visited a Norfolk pig farm, a Manchester estate, and Chillingham Castle in Northumberland. Meet the Natives: USA is a spin off of the UK version of this television series in which the tribesmen travel to the United States, this time on a quest to learn more about the land and also share their ideas and beliefs. Meet the Natives: USA aired on the Travel Channel in November and December 2009. For their first stop, the tribesmen traveled to a cattle farm in Montana. During their visit, they learned how Americans raise and maintain farms. The tribe did not like the fact that medicine is injected into the cows that people actually eat for the fear of "spoiling the body". The men visited New York's upper class area where they meet Bunny, who lives alone while her husband is away on business and her children are away at college. Bunny introduces them to the art of painting. The tribe starts to realize that America lives off of money. They take interest in an individual who is homeless and quickly explain how their culture would not allow for an individual to be homeless. In Peoria, the tribesmen get the chance to experience Thanksgiving. While helping cook the meal, they have some concerns with the way in which the food had been stored. They were particularly concerned with using a plastic oven bag to cook the turkey in for the fear of being poisoned. They also were shocked that people ate food that has been stored in tin cans for months, maybe even years. They realized that the way Americans cook is very different from the way they are used to cooking. The men travel to Orange County, California where they experience the life of being pampered with pedicures, facials and mud baths. They also play golf, observe a home Botox party, and ride roller coasters at Knott's Berry Farm. They notice that there is a lot of food available as well as the usage of cars for almost everything. The tribesmen travel to Fort Stewart and Washington, D.C., where they learn more about the war that America is fighting and they also give advice on keeping peace. They explain that they do not agree with people fighting other people and they vigorously tried to relay the message that America should put the guns down and keep peace. They speak with Colin Powell to try to get their message across to the people of America. The group reflects back on the experience they had while visiting America. They express that they know there are some differences, but for the most part people in America are loving and very welcoming individuals. They also reflect back on the "big animals" of America, such as the buffalo, and their first time seeing snow. While in the U.S they loved eating ice cream and sweets such as candy. They are preparing to go back home and tell the rest of their tribe about their experience and everything they learned about American culture. Chief Mangau is the chief of the tribe who is the elder and leader of their tribe. He was sent with the others by his father, the supreme chief of the tribe back in Tanna. His purpose of going on this journey with the other four men was to serve as a leader and to help keep the rest of the men on track. He is the oldest of the five men at the age of 65 years old. Keimua serves as the "head dancer" of the group. Back in Tanna he helps coordinate dance routines and teaches the children of the tribe how to do the traditional dances. In America he brings smiles to many faces with charm and love for dancing. Sam is the "medicine man" of the tribe and serves as somewhat of a doctor of the tribe. During his visit to the United states he was specifically interested in how Americans treat themselves of different infections and diseases. He gave advice and shared the different treatments that his tribe has traditionally used throughout the tribes history. Kuai serves as the "happy man" of the tribe. He is known for spreading happiness and jokes. In Tanna his purpose is to help keep the tribe happy in times of sadness and also everyday life. While in the United States he kept the families that they were staying with laughing and kept the field open for memorable moments. Namus is the translator of the group. Holding one of the most important roles of the group he helps to connect the two worlds together. Without him the experience may have been very different for the tribe and the families in America. As a young child he had gone away to school to learn English. He is also the youngest of the group at the age of 27 years old. "Tom Navy" is one of the major reasons for the tribesmen's visit to the United States. The tribe has learned that America is at war and they want to return the message of keeping peace that the U.S had given them once before. During World War II, the Americans helped to keep the tribe at peace during a time when the tribe was fighting. "Tom Navy" is described as an African American serviceman who helped the tribe during this time. During their visit to America the tribe had wished to meet Tom Navy to thank him for his help, provided during hard times. The show's executive producer, Charlie Parsons, guessed that back during the war there was a man by the name of Tom, who was from the Navy and his name was understood by the tribe as being Tom Navy. In the UK series, the tribesmen meet finally and off-camera, Prince Philip, who they adore as a god. The Prince Philip Movement is a religious sect followed by the Yaohnanen tribe on the southern island of Tanna in Vanuatu. The Yaohnanen believe that Prince Philip, Duke of Edinburgh, the consort to Queen Elizabeth II, is a divine being; the pale-skinned son of a mountain spirit and brother of John Frum. According to ancient tales the son travelled over the seas to a distant land, married a powerful lady and would in time return. The villagers had observed the respect accorded to Queen Elizabeth II by colonial officials and came to the conclusion that her husband, Prince Philip, must be the son from their legends. When the cult formed is unclear, but it is likely that it was sometime in the 1950s or 1960s. Their beliefs were strengthened by the royal couple's official visit to Vanuatu in 1974, when a few villagers had the opportunity to observe the Prince from afar. At the time the Prince was not aware of the cult, but the matter was eventually brought to his attention by John Champion, the British Resident Commissioner in Vanuatu between 1975 and 1978. The Resident Commissioner suggested that the Prince send them a portrait of himself. A signed official photograph was duly dispatched. The villagers responded by sending a traditional nal-nal club. As requested, the Prince in return sent them a photograph of himself posing with the weapon. Another photograph was sent in 2000. All three photographs were kept by Chief Jack Naiva, who died in 2009. 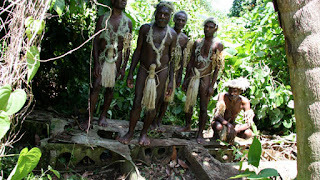 On September 27, 2007, British television station Channel 4 broadcast Meet the Natives, a reality show about five Tanna natives of the Prince Philip Movement on a visit to Britain; their visit culminated in an off-screen audience with Philip, where gifts were exchanged, including a new photograph of the Prince. Yaohnanen people were featured on the second season of the Spanish television series "Perdidos en la Tribu" (Lost in the Tribe), on which they cohabitated with a Spanish family during the course of 21 days, teaching them their customs and culture, and also in the first season of the same Portuguese series called "Perdidos na Tribo".